This is an Ezy Homes review of the website. Ezy Homes provide a floor and or roof solution for any building site. They handle the design, drafting & engineering. Each steel frame kit is custom made & simply bolts together. Rigging crews are available. Full Kits take the hassle out of estimating and ordering. As well as custom designed Frame Kit, Ezy Homes can supply all required building materials through to fix-out stage - delivered to site as required. Overall this is an excellent website. Well set out and wins on all of my parameters, including owner builder support and pricing. They appear to specialise in pole housing as well. This company supplies 'build your own' home kits. 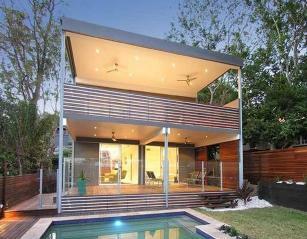 This Ezy Homes Review is of a kit homes Queensland provider. This comment section has now closed. Comments on this page have now closed. No more posts will be published. Existing posts will remain on this page.